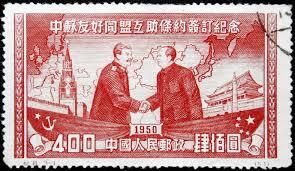 Following the declaration of the CCP’s victory against Chiang Kai-Shek and the establishment of the People’s Republic of China on October 10, 1949, Mao and his party set about building China into what they hoped would become a unified, socialist state. officially declared victory, a national currency, the yuan was introduced. Having gained complete control, the CCP set about reducing the amount of paper money in circulation in order to curb inflation, setting price controls that would ensure stable trade and reforming taxes. By 1951, the inflation rate had been lowered from 85 000% (in 1949) to 15%. Government revenue, meanwhile grew from 6.5 billion yuan in 1950 to 13.3 billion in 1951. In this initial stage of the economy’s development, there was no strict persecution of the bourgeois capitalist class which Communism planned to eventually overthrow – the government spoke of allowing some ‘capitalist exploitation’ if it achieved the right result and letting ‘the bourgeois exist and develop for several decades’. The CCP thus introduced a system of ‘national capitalists’ – the banking sector, transport industries, electricity and gas suppliers were all nationalised, but the regime would continue using the resources and expertise of industrial capitalists, and some compensation would be provided for when their enterprises were nationalised. The nationalisation program was slow to roll out, with 75% of Shanghai’s workers still belonging to private enterprises in 1950. To fund the building of a communist, modernised state, the CCP turned to the Soviets, asking for their financial support. On 14 February 1950, the two countries signed the Treaty of Friendship, Alliance and Mutual Assistance. Under the treaty, Moscow agreed to support Beijing should it enter in a military confrontation, and extended a $300 million loan to China, half of it devoted to military expansion. The Soviets helped set up 50 large-scale industrial projects in China, and sent 10,000 engineers to China, while 28,000 Chinese engineers went to the USSR to train there. In return, China signed secret annexes that recognized Manchuria and Xinjiang as being Soviet spheres of influence, and agreed to give the USSR exclusive rights to ‘surplus’ stocks of tin, tungsten and antimony for 14 years – historian Fenby argues that this deprived Beijing of the chance to earn foreign currency by selling these minerals elsewhere1. Echoing the Western businessmen of the days of the Qing, Soviet advisers were not subject to Chinese law. While the Treaty allowed China to expand its industry in a precarious financial situation, by 1955 China was repaying more than it was receiving in aid.